In the first half of the 19th century, a series of censuses were done to determine the distribution of parliamentary representation. Shortly after the Act of Union created the Province of Canada, consisting of Canada West (present-day Ontario) and Canada East (present-day Quebec), legislators agreed about the need for a census in September 1841. It was to be completed by February 1, 1842. In Canada East, enumerators visited 23 census districts, divided into 139 sub-districts. These units were made up of cities, towns, parishes, villages and townships. Unfortunately, not all returns have survived. For various reasons, this census was not a success and it was retaken in May, June and July 1844. The total count of the population of Canada East in 1842 was 697,084 individuals. 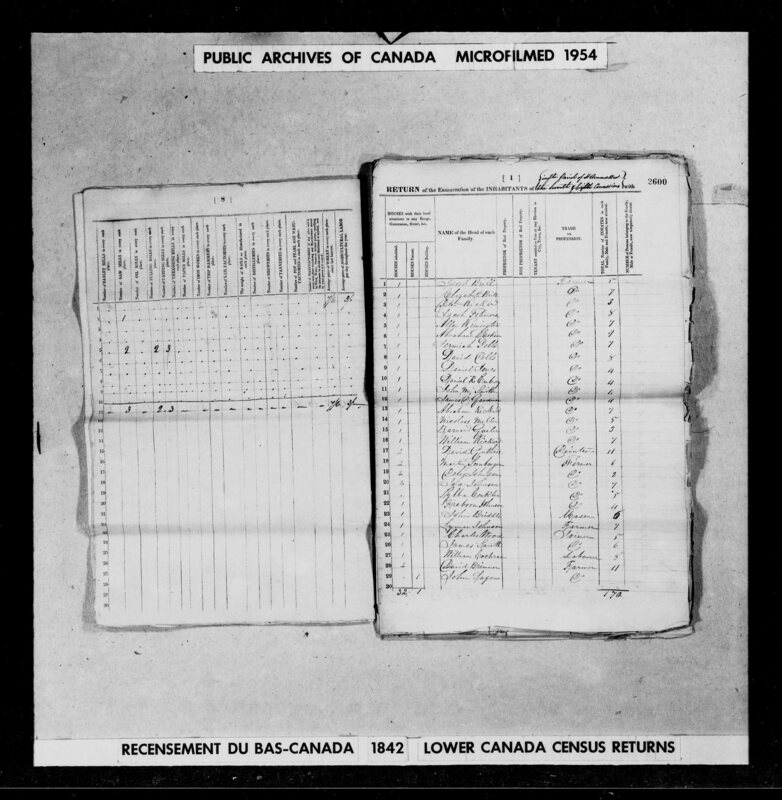 Only the census returns for 1842 have been preserved. This census is partly nominal, meaning that only the names of the heads of families or households were collected. The other members of the families or households were counted, but not named, and totals were recorded per category. 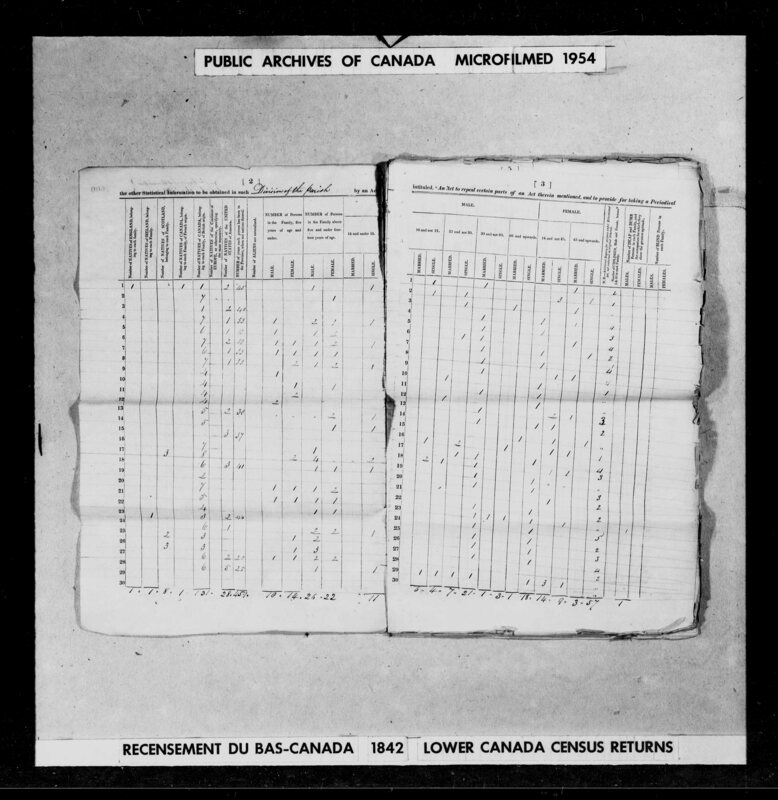 In 1955, the Dominion Bureau of Statistics was authorized by the Public Records Committee to microfilm and destroy the original paper records of the 1842 Census of Canada East. 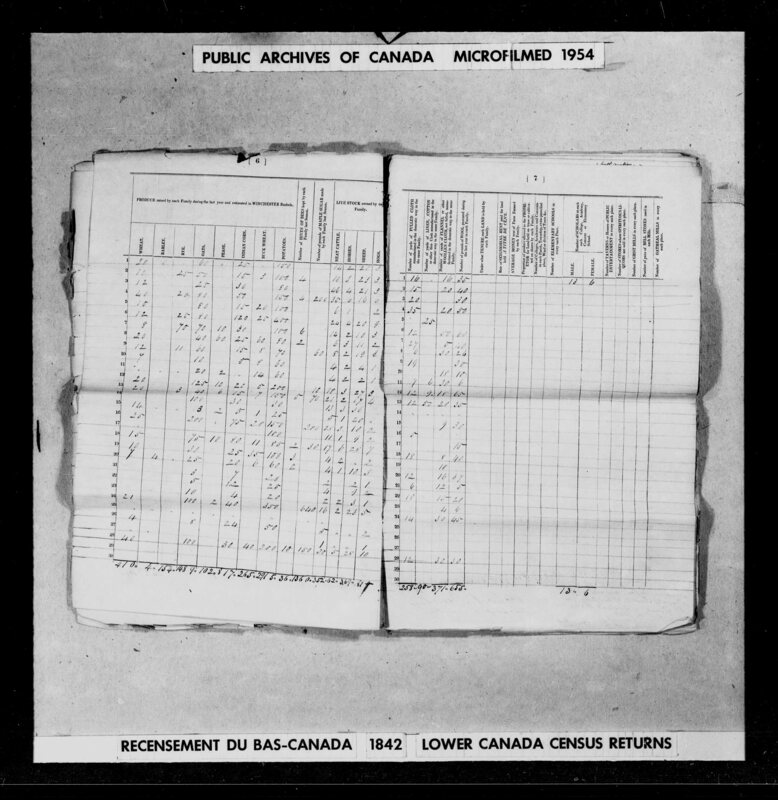 As a result, only a microfilm copy of the census exists as an archival holding. The microfilming of these records was not of consistent quality and not all images are readable. A pre-printed or hand-written form was used with headings written in English or in French. For your convenience, we have included the headings used on the English forms in Canada West. The enumeration data were collected using one document, known as a schedule, which included a total of 89 questions, spread across 8 sheets. Questions were asked either in French or in English in Canada East depending on the language spoken by the enumerator. 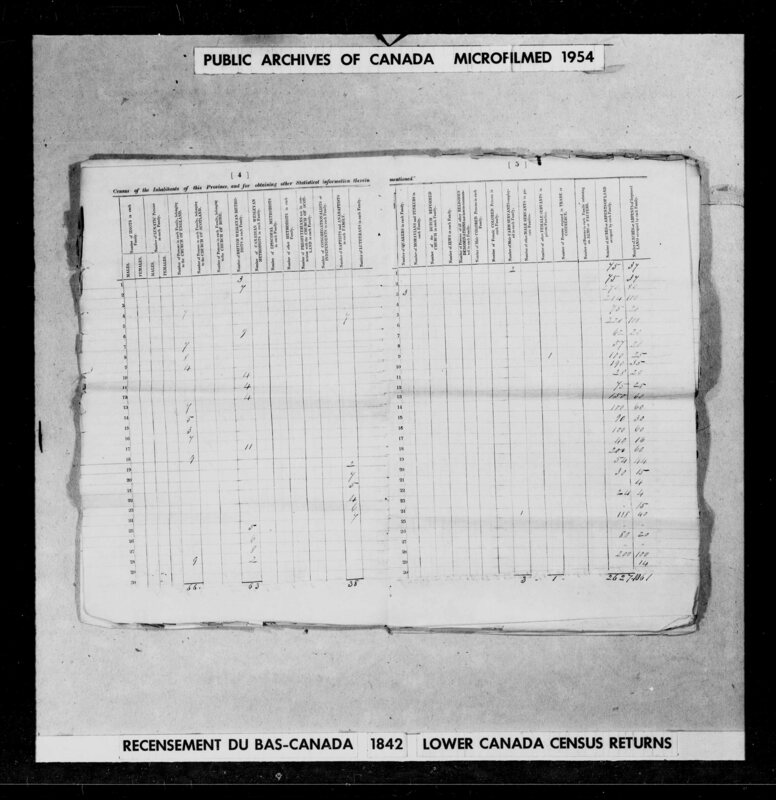 No agricultural or other type of schedules exist for this census. No document providing the instructions to enumerators on how to collect the names and other information in 1842 has been located. 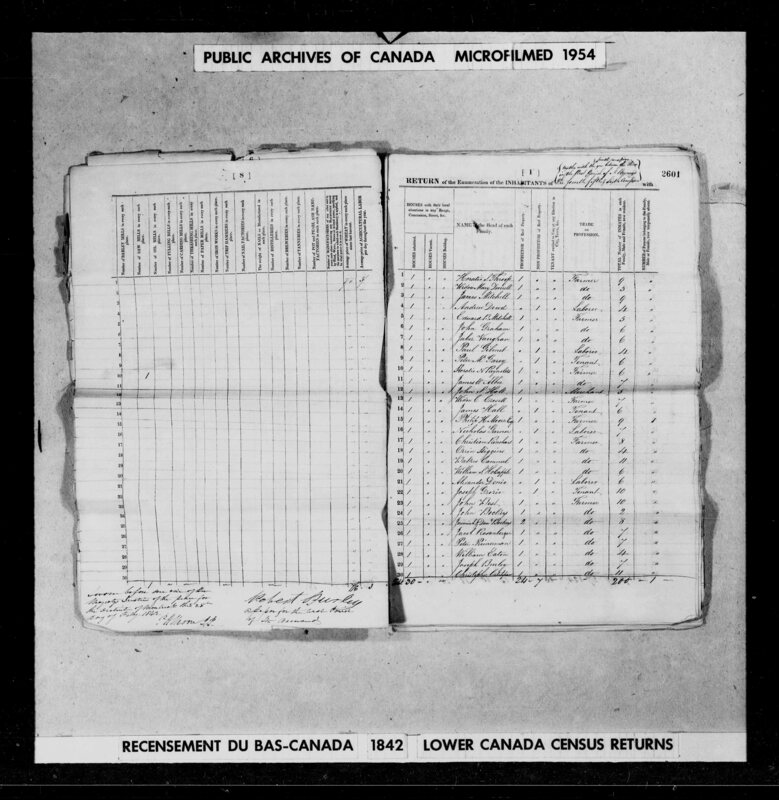 The first page is on the digitized image link to an entry in the database for an individual. If you want to view the second page and the following pages, increase by one the last digit of the url address of an image that appears in the navigation box of your browser. To view all columns associated to an individual, you will need to view four images. A Map of Canada East and West (MIKAN 3694915) shows the limits of the districts in 1842.